An evening of recent works by MFA and BFA students. It presents a collection of work as an intermission between semester coursework. 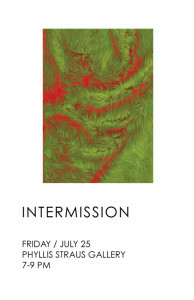 “Intermission” not only includes current works but the direction students are taking towards their graduating theses. This exhibition will be open to the public July 25 at the Phyllis Straus Gallery from 7pm to 9pm. Food and drinks will be provided.